I am a semi retired graphic designer and illustrator (www.bauschdesign.com}, and have been building models on and off since I was just a kid. I grew up in San Gabriel (southern California) from 1939 to 1947 (age 1 to 8), all during WW2, so at a very impressionable age, saw all kinds of warplanes flying over every day. Hence my interest and love of aircraft. 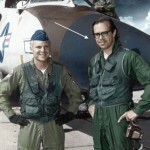 Participated in the Air Force Art Program in the 1970’s and 80’s, and had several interesting flights as a result: supersonic in an F-106B at Tyndall AFB in 1972 at the William Tell ADC contest, tactical flight in a T-38 at Eglin AFB in 1973, and an 8 hour training flight in a B-52G out of Castle AFB in 1981. Also flew from Beale AFB to Farnborough in England in the C-141 support aircraft in September 1974, to see the landing of the SR-71 Blackbird after its record breaking flight New York to London. Met Lockheed’s amazing designer, Kelly Johnson, at Farnborough on that trip. Things like this gave a great continuing of interest in aircraft, and it still continues today.